A dental bridge is a fusion of two or more fabricated dental crowns that function to restore chewing and fill the space of a missing tooth or multiple teeth. A bridge is comprised of two components, abutments and one or more pontics. Abutments are best described as the teeth with roots (gray color in illustration below) that anchor or support the entire dental bridge. Pontics are replacement teeth (crown portion only, no tooth root) that fill the space of missing teeth between abutment teeth. The bridge abutments and pontic crowns are fused together and are permanently cemented over dentist prepared teeth. Dental bridges are a permanent tooth replacement option. How many teeth can a dental bridge replace? A bridge can replace multiple teeth if necessary. How many teeth are missing along with the health of the abutment teeth will determine the number of anchor and replacement teeth necessary in order to restore optimal chewing function and fill the missing tooth space. Why should I consider replacing my missing tooth with a dental bridge? Prevent bite collapse. Mother Nature does not like a void. The adjacent and opposing teeth will shift to fill the space of the missing tooth or teeth over time. There are four main types of bridges available. Upon completion of a dental examination, your dentist will discuss the best available treatment options so that you can make an informed decision regarding proposed dental treatment. Fabricated and temporarily cemented immediately following a tooth removal in a highly visible part of the mouth. An acrylic temporary bridge serves as an interim bridge while your tooth extraction site heals, typically 10-12 weeks. Once healed, your dentist can then prepare abutment teeth for a permanent dental bridge. The bridge procedure is pain free and typically requires two dental appointments. 1st Appointment (2 hours): bridge preparation, impressions, fabrication and placement of a temporary dental bridge. 2nd Appointment (40 minutes): bridge cementation, try in permanent bridge and ensure a custom fit prior to final cementation. Digital x rays and a photograph of the teeth are taken prior to preparation of teeth. A preliminary dental impression is taken and is used to fabricate a custom temporary bridge after preparation procedures are complete. This temporary bridge will be temporarily cemented in place while the dental lab fabricates your permanent dental bridge. Once your teeth are completely numb feeling, the dentist will prepare your teeth by reducing the size of the abutment teeth to custom fit a permanent bridge. After teeth are prepared, the dentist will take a series of dental impressions of the teeth and of your bite. These impressions are then sent to the dental lab and used to fabricate your permanent bridge. Finally, your dental assistant will temporarily cement your temporary bridge in place, review post appointment instructions, and schedule a future appointment to permanently cement your fabricated dental bridge. Dentist will place permanent bridge and perform a series of tests to ensure that fabricated bridge fits your teeth and fills the missing tooth space perfectly. Once the bridge is checked and fits perfectly, the dentist will permanently cement your bridge in place and will review post appointment instructions. Note:The dentist will recheck your bridge at every future preventive visit. Or click the button below to request an appointment online. Q. 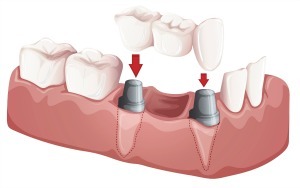 What is the difference between a dental bridge and a dental implant? A. 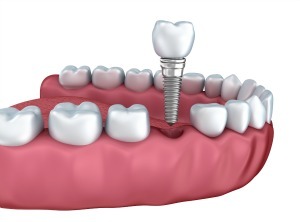 A dental implant is a single, entire tooth replacement (root and dental crown) used to restore chewing and fill the space of a missing or previously extracted tooth. There are no abutments or pontic. Q. Is it better for me to replace my missing tooth with a dental bridge or with a dental implant? A. It depends. Dental bridges and dental implants are both viable, permanent tooth restoration and replacement options to consider. There are often advantages of electing on option over another. Your dentist will discuss your options and explain the pros and cons of each option so you can make an informed decision about which option is best for you. Q. Is the dental bridge procedure painful? Q. How do I care for my temporary bridge? A. You’ll want to brush and floss. A bridge threader is required to clean the space under the pontic. Should you accidentally pull your temporary bridge off, just call us at (763) 586-9988 and we’ll recement it back into place. Q. How do you floss under a dental bridge? A. You won’t be able to floss your bridge the same way as you floss your other teeth. A bridge threader is used to clean under your dental bridge. Bridge threaders can be purchased in the dental aisle of your favorite store or pharmacy. There are many styles available. Your dental assistant will dispense an initial supply of bridge threaders and will show you ho to floss under your new bridge. Dispense a 8-12 inch piece of dental floss. Insert the dental floss through the eye of a dental bridge threader. Insert the end of the dental threader at the base between your bridge pontic and abutment. Push threader through till visible on the inside of the mouth. Hold your floss in one hand and with the other hand remove the bridge threader. Floss the side of abutment tooth. Slide the floss under the pontic to the other abutment tooth. Floss the side of the abutment tooth. Remove floss strand from underneath bridge by pulling floss out backwards to exit mouth. Below is a short Youtube video demonstrates how to use a dental bridge threader. Click here to watch video on Youtube. Q. Are there any foods that I should avoid in the interim till my bridge is permanently cemented? A. It is not uncommon for the teeth to be extreme temperature sensitive initially (2-3 days) following your bridge appointment. Using a desensitizing toothpaste in the interim can help. Q. What happens if my temporary bridge becomes loose? A. Don’t panic. Remove the temporary bridge to avoid accidentally swallowing it and call us as soon as you can. We’ll temporarily recement your temporary bridge back into place. Note: It is very important to have your temporary bridge in place the entire time while your permanent one is being fabricated. If the temporary bridge falls out and is not recemented in a timely fashion, the adjacent teeth will begin to shift and potentially impact the fit of the permanent dental bridge. Q. Are dental bridges covered by dental insurance? A. Most comprehensive dental insurance plans provide some level of dental bridge coverage. This varies among dental insurance plans. Prior to scheduling your bridge appointment, one of our patient care coordinators will review your specific dental insurance coverage with you and inform you of any plan deductibles and/or estimated out of pocket expenses. Some dental insurance companies have a missing tooth clause. A missing tooth clause is hen a dental insurance company declines insurance coverage to replace a missing tooth that was extracted prior to existing dental insurance coverage contract. Q. What if I don’t have dental bridge coverage? A. Dentistry for the Entire Family offers a cash discount for patients without dental insurance coverage. Need flexible payment options? Click here to learn more about available financing options through Care Credit and Wells Fargo. Q. What is the difference between a traditional and a cosmetic dental bridge? A. An individual may elect to have a cosmetic bridge placed to improve or enhance the visible aesthetics of their smile. Cosmetic bridges are not typically covered by dental insurance plans. People who are born without a permanent tooth to replace an exfoliated primary (baby) tooth. Call (763) 586-9988 to schedule an appointment or click green button below to request an appointment online.